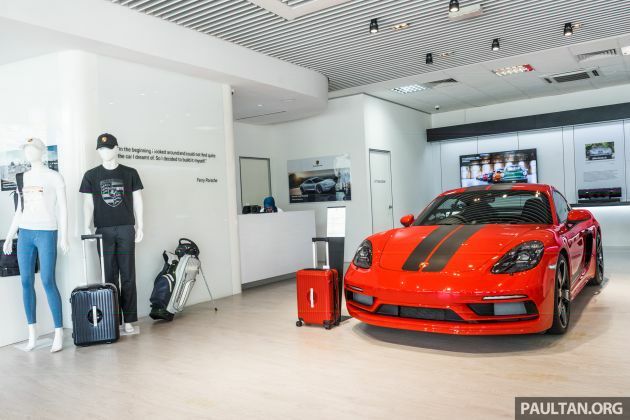 Porsche’s Malaysian distributor Sime Darby Auto Performance has opened the doors to a new pop-up store in Penang, Zuffenhausen’s first such outlet in Malaysia. The 1,603 sq ft facility, located at the Gurney Paragon mall in George Town, aims to provide a more convenient customer experience in the region, as it’s situated within the island itself (Porsche Centre Penang proper is on the mainland, in Seberang Perai). The pop-up store has space for one display car – in this case, the 718 Cayman SportDesign, one of only 15 to be made – as well as a variety of branded merchandise, including Porsche Driver’s Selection apparel and a bookshelf (made from the rear wing of an actual 911 GT3 R race car) costing a whopping RM22,000. Customers can also book test drives and drop off their vehicles for maintenance by making an appointment with Porsche Centre Penang, and they can also peruse Porsche-related reading materials and utilise coffee-making facilities while they’re there. “As part of our commitment to a priceless and unique ownership experience for our owners in the northern region, the new pop-up store offers a drop-off service for customers by appointment for vehicle service maintenance. Customers can opt to leave their vehicle at the drop-off area of the new pop-up store while we handle the transporting and servicing at Porsche Centre Penang,” said SDAP CEO Christopher Hunter. We visited the Porsche pop-up store as part of our Porsche Club Malaysia Drive of the Year 2019 coverage – you can read parts 1 and 2. The post Porsche opens first Malaysian pop-up store in Penang appeared first on Paul Tan's Automotive News. 0 Response to "Porsche opens first Malaysian pop-up store in Penang"